And see Robin Seguy's 2013 textual edition of the poem "Asylum" synched to source text. My first book of poetry, published in 1975, when I was 25, is called Asylums. 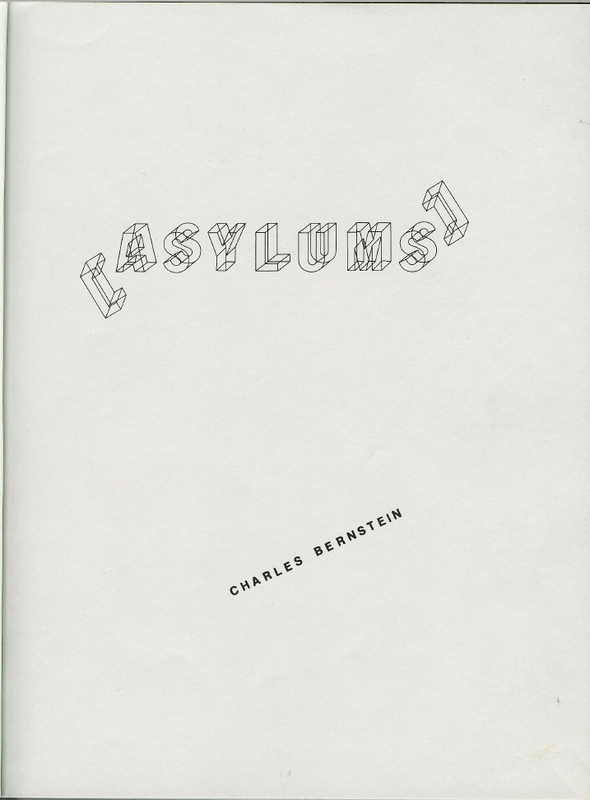 Susan Bee and I created our own press – Asylum’s Press – for the occasion, though in this first book the press name is given on the back of the last page of the book as Asylums Press. I have always like the association of poetry with the press of asylum, though whether lunatic or a sanctuary remains an open question. Over the next couple of years, we went on to publish five other books under the imprint: Susan’s Photogram, her first artist’s book, a fantastical reinvention of the photogram, and four works of poetry – Peter Seaton’s Agreement and Ted Greenwald’s Use No Hooks; Ray DiPalma’s typewriter visual poem, Marquee, with an introduction by Steve McCaffery, and my second book, Parsing. Asylums had a lovely presstype cover, by Susan, printed on light grey card stock, with a blank back cover. It was 48, 8½ x 11” pages, xeroxed from the (Remington) manual typewriter manuscript of the five poems included: “Asylum” (March 1975), “Lo Disfruto” (August-September, 1975), “Ipe” (March 1975) ,“Out of This Inside”(February-March, 1975) and an untitled 15-page poem that consists of a continuous progression of two-word lines, each beginning “my” (July 1974). The binding was the poetry classic of the moment: sidestaple. There is no table of contents or title page, just the typescripts of the five poems. And there is no date given for the book publication, though each of the poems is dated. I am not sure how many copies I made, probably no more than 50. There is no colophon. The structure of this book, a constellation of markedly discrete works, is one I would come back to again and again. Each poem makes its own world, each is formally and thematically distinct from the other poems in the book – if not an asylum than a “republic of reality.” The title poem uses short clips – lines usually made up by taking the last words of a sentence and the first words of the next – from Erving Goffman’s Asylum, a book that explored social institutions cut-off from the outside world, from prisons to monasteries to psychiatric wards. This poem was also one of my first magazine publications: Ron Silliman included it in his little magazine (also xerox and sidestapled), Tottel’s in 1976. And I later included the poem in Islets/Irritations (1983), the book that is perhaps the best structurally realization of what I had in mind for Asylums. “Lo Disfruto” and a very revised version of “Out of This Inside” were included in Poetic Justice (1979), a collection of prose poems, which was subsequently included in the large collection of books published by Sun & Moon in 2000, Republics of Reality: 1975-1995. “My/my/my” was never otherwise published, though I did a multi-track tape realization of the work in 1976 that was published as a part of a collection of my audioworks called Class (now available on PennSound). “Ipe” is the one poem from Asylums I never subsequently published, even though it remains a kind of ur piece for me. The 13-part serial poem is closely related to Disfrutes, written in 1974 but first published in 1981, which I have just released this year in a web edition. Both could be described as quasi-minimal: the poems built on shifts and dislocations often occasioned by the change of a single letter. I was, and am, committed to the concept of self-publishing; that writing poetry is part of a nexus of publishing poetry, reading poetry, reviewing poetry, writing poetics, teaching poetry. It was important to me not to just “privately circulate” my manuscript – which in a sense is what I was doing – but to publish it, to call it a finished work ready for the world, not waiting for someone else to legitimate. Also, publishing my own work in this way brought me directly in the economy of exchange that has been such a central experience of doing poetry and was a direct impetus to starting a reading series at the Ear Inn in New York in 1978 (with Ted Greenwald) – a series that continues on to this day, in the same Saturday afternoon time slot, though now it is at the Bowery Poetry Club; and, also in 1978 coediting, with Bruce Andrews, a magazine of poetics, L=A=N=G=U=A=G=E, also a typewriter-and-quick-copy affair (both offset printed and later Xeroxed). Jumping ahead to the mid-90s, these experience were also fundamental to the connection of the Electronic Poetry Center (writing.upenn.edu/epc), a web site on which I have worked as editor since its founding by Loss Pequeño Glazier, as well as PennSound, a vast archive of sound recordings, which is cofounded with Al Filreis in 2005. My advice to young poets is always: start your own magazine or press, & publish your own work and those of your contemporaries whose poems seem most crucial for the art. And if possible, respond as much as possible, through poetics and reviews, to this work. Articulate its values, value its articulations. The web certainly makes such publishing easier, but it does not solve the hardest part, finding a community of other poets that allows for active and intense exchange, not based just on location or friendship or like-mindedness, but on the qualities and quiddities of the work as it unfolds in time and space, on earth and in the heavens of our imaginaries.